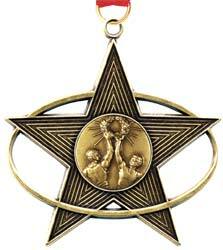 The World Class Awards Rising Star medals are our most popular. Designed and created right here, the Rising Star manages to offer a powerful design at an incredibly low price. The medal comes in 3 finishes and 60 events, and also includes a free ribbon. This item is available for immediate shipment! Click here to see how your customized medal will look before choosing your options. Order in just 3 easy steps! Click here to view your design choices. Click here to view your ribbon choices. Ribbons come packaged separately for protection. For optional assembly, add $0.10 per medal. Click here to view the available finishes. You may choose to personalize your medal with engraving or silk screening. You may not engrave and screen at the same time. Engraving - $2.00 per line, per medal. Limit 20 characters per line. Add Screening. I will e-mail my artwork. All medals come individually packaged in plastic polybags. Production Time: 2 days. For screening, add 2 weeks. Our expert consultants will cheerfully guide you through your questions and concerns. Our newest medallion award features classical, modern and patriotic elements, each of which makes the award shine ever more. Its eye-catching design makes it a powerful conversation piece. Our rock-bottom introductory pricing won't last, so order today! Enter your name and e-mail address below to receive a Free Buyer's Guide. It will make buying the perfect award easier than ever. © World Class Awards LLC. All rights reserved.